The value of your coins will largely depend on the three factors noted above. Of course, not all coin dealers are willing to pay you top dollar for your coins, so it’s important that you research the value of your coins as well as the coin dealer you’re considering before you sell your items. At Nashville Gold and Coin Buyers, we primarily use the ‘Handbook of US Coins’, otherwise known as the ‘Blue Book’ by coin dealers. We use this guide during our coin evaluations to properly appraise your collection, and openly share the prices of the coins with you so that you can be assured that you’re receiving a fair price for your coins. You can also obtain the latest ‘grey sheet’, or the Coin Dealer Newsletter, to research the value of your coins. Typically, dealers will quote 50-60% of the bid price in the grey sheet. We pay 70-80% of the bid price, so you can feel confident that you’re receiving top dollar for your coins. 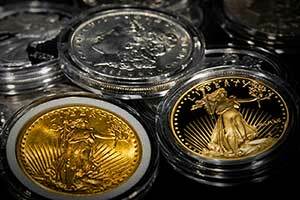 We provide free, no-obligation coin appraisals. If you’re in Metro-Nashville, you can schedule an appointment to meet with us at our Nashville office. If you would prefer to conduct business online, you can utilize our mail-in option to receive the same great customer service and prices that you would during an in-person appointment.